Well Earth-75 is off to a slow start....but honestly it's just an exercise for me in character building and putting stray ideas that don't fit into the games I'm currently running or characters that I don't want to add to the FC setting. a) I really like Nauck's artwork. b) Many of the characters powers are interesting. c) And most importantly I got a number of ideas on how to use them in the FC setting. Last edited by Tattooedman on Thu Mar 20, 2014 9:17 pm, edited 2 times in total. Costs: Abilities 26+ Skills 12+ Advantages 8+ Powers 108+ Defenses 11= 165 pts. Disability: Blacktion Man cannot talk. Just A Toy: When it's all said and done, Blacktion Man is just a really unusual golem and sometimes has trouble understanding societal habits. Looking For His Friend: Blacktion Man is still looking for Tommy after all these years. Motivation ~Doing Good: Blacktion Man was brought to life by Tommy's wish and as such behaves very much as the young boy believed a hero should - helping those in need, being a good role model and such. Background: So what do you get when a lonely little boy makes a birthday wish to have a best friend that’d never go away and REAAALLLLYYYYY wants it? A living action figure, that’s what. See Tommy Troy’s parents had died when he was only six and with no living relatives to take the boy in he was made a ward of the state and like most other tales you might have heard that sound similar it was a hard life growing up for him as he was a quiet child. He was too old for most of the young couples who came looking to adopt a child and too young for the halfway houses to take in, so he stayed in the state run facility that was almost as large as the local city church. Among the old, beat up and worn toys the facility had for the kids to play with was an old action figure that had been put through the wringer; his painted on clothes had been halfway scratched and worn off, and he had none of the old accessories he’d had back when he was brand new. But when Tommy saw the six inch action figure he didn’t see any of the wear and tear, instead he saw the hero inside the toy waiting to be released. So with a few strokes of a paint brush and carefully laid out outlines Tommy set to painting his new found friend; a new red shirt with blue trunks to make his stand out as all the great heroes wore those colors and since the yellow didn’t show up that well he got white wristbands, boots and a belt. But since the action figure’s face was almost gone Tommy decided it was easiest to just make his mask black and covered the remaining unpainted parts (the arms and legs) to match. When it was all said and done, Tommy had created his own personal superhero. But there was just one thing missing – what to call him. Tommy wanted his best friend and hero to have a really cool name. 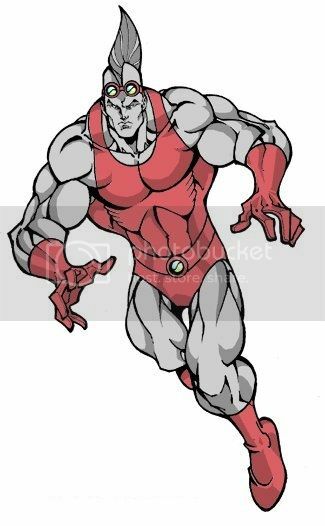 One that stood out and let everybody know that he was the best and most awesomest hero there was. Several days went by and Tommy still hadn’t come up with a name that fit his rigid standards and he was starting to feel like he was never going to be able to name his hero and that he’d never save people from burning houses, stop the bad guys and help people. Then Tommy heard some of the older boys talking about a movie they’d just seen, Super Fly. They were going on and on about how it was the greatest blacksploitation movie they’d seen and went on to list some of their other favorites. But Tommy had heard enough, he’d finally figured out what he’d been struggling with for the past several days. He had the name of his hero: Blacktion Man! For the following few months Tommy put Blacktion Man through several adventures which took him all over the world (or at least all over the realms of Tommy’s imagination) and then Tommy’s birthday came and he was given a cake with candles and told to blow them out then make a wish for something special and secret he wanted. Tommy immediately knew and blew out all the candles of his cake on the first try. But Blacktion Man didn’t move. Not a single twitch of one of his hard plastic limbs. Nothing at all. Feeling a bit dejected Tommy went to bed but hours later he was woken up by a gentle hand on his shoulder. When the young boy opened his eyes he saw that his wish HAD come true! Blacktion Man was standing next to his bed, somehow he’d grown to full size and was waking Tommy up to show him that his wish had somehow been granted (which was difficult given that Blacktion Man couldn’t speak at that point and time). Years went by with Tommy keeping the secret of Blacktion Man, and every night they’d have adventures (created by Tommy) that took them all over the world. But then one day Tommy went to school and never came back. Blacktion Man never knew why his friend never returned to him, and he waited for several days until Blacktion Man finally realized that this must be a new adventure Tommy had made for them. He needed to go out and find Tommy, then they could fight evil together! So in the middle of the night the tiny, animated action figure snuck out of the state run institution to look for his first and truest friend. What Blacktion Man found outside those walls were adventures very similar to the ones Tommy made for them nightly, but Blacktion Man never did find Tommy. Though he did eventually make new friends, none of them could ever replace the little boy who had somehow brought his action figure to life with a simple wish. Costs: Abilities 50+ Skills 24+ Advantages 25+ Powers 48+ Defenses 22= 169 pts. 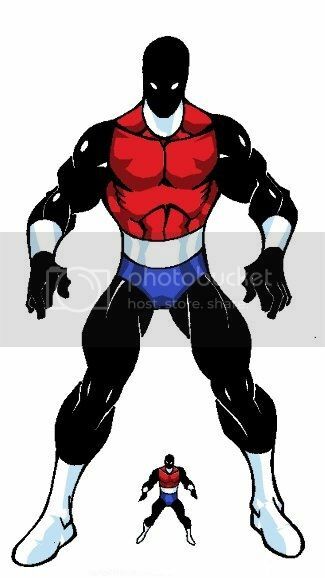 Motivation ~Thrills: Astro-Girl has grown up at the side of her space adventuring father (Space Ranger) for several years and sees her role as a hero on Earth as just one big, on-going adventure. Out Of Town Gal: Astro-Girl has only heard stories of Earth from her father thus her understanding of Earth culture stops somewhere around the late 1960s, thus there is much about modern society that confuses her. 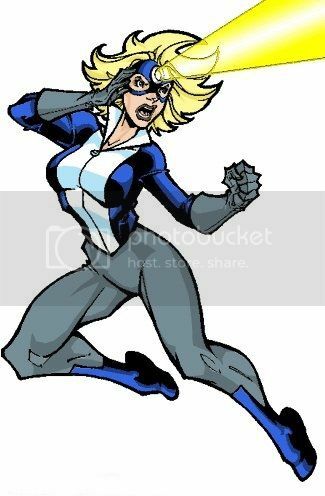 Public Heroine: As Astro-Girl, Sherry is becoming a super hero with a growing following of fans and she makes no effort to conceal the fact she is Sherry Shepard. Relationships: Her closest friends now are Dave Lancaster (Patrol Man) and Mary Higgins (Headlight). Background: Sherry Shepard, the daughter of 'lost' astronaut Chuck Shepard (who became the intergalactic hero known as the Space Ranger) , but a stray asteroid hitting her craft as she entered Earth's solar system led to Sherry crashing in the mountains near Emerald City, injuring a young couple, Dave and Mary, who were hiking there. Sherry was able to save them thanks to her ship's med-bay and they ended up becoming friends as the couple helped Sherry become acquainted with her father's world and during their adventure the trio continually ran afoul of super crooks. Eventually Sherry equipped Dave and Mary with items she'd brought along from her home planet, an alien made powersuit (given to Dave) and gemstone (given to Mary), that allowed them to help her deal with the troubles she kept running into. 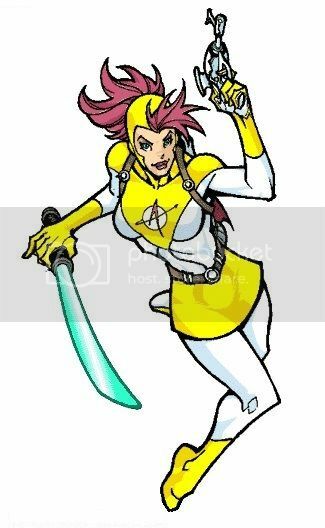 Now with Patrol Man (Dave) and Headlight (Mary) backing her up, Astro-Girl is touring across the United States and developing an online following that is highly devoted to her. Costs: Abilities 42+ Skills 20+ Advantages 8+ Powers 57+ Defenses 18= 145 pts. Identity: Patrol Man keeps the fact that he is Dave Lancaster a secret to protect his family. 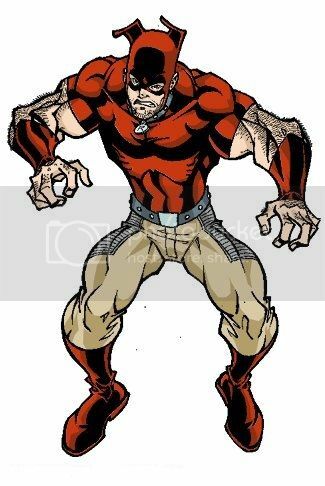 Motivation ~Responsibility: Patrol Man believes that it is his duty to use all his skills at his disposal to protect the public from the various threats he encounters with Headlight and Astro-Girl. Relationships: Marry Higgins (girlfriend, aka Headlight), and is good friends with Sherry Shepard (aka Astro-Girl). Background: Dave Lancaster went out for a romantic, moon light filled, walk with his girlfriend, Mary Higgins, when they suddenly found themselves at ground zero of an space ship’s crash landing. Both Dave and Mary were hurt because of the crash, and the ship’s pilot, a humanoid girl with bright pink hair, was able to get both of them into her the vehicle’s med-bay and treat their injuries. When the pair woke up hours later they learned that their rescuer was named Sherry Shepard and that while she’d been born and raised in the far ends of space she was actually human (well half human actually, her mom was a native of the planet her Earthling father found himself on). Sherry went on to tell Dave and Mary that she’d travelled back to Earth to learn more about her father’s home and her connection to it. Seeing a few problems with her plan, the couple offer to act as her guides as to keep her extraterrestrial nature a secret. Thrilled to have met and befriended her first Earthers, Sherry agreed and within days she was sight seeing around the country (which wasn’t exactly what Dave and Mary had in mind but simply went along with it as they had little other options). During the course of the trio’s trip they ran afoul of numerous super crooks who seemed to be targeting the locations Dave and Mary were showing to Sherry, which is when they learned that Sherry had been raised at the side of a space adventurer and had picked up a number of tricks of her own during that time that were useful in the situations they constantly found themselves in. Eventually Sherry decided that she needed to have backup and after raiding the storage locker on her ship she presented Dave and Mary with two unique items; in Dave’s case he was given a powersuit that had been originally made for her father but he’d found it uncomfortable to wear and simply put it into the storage space on his old ship and forgotten about it. 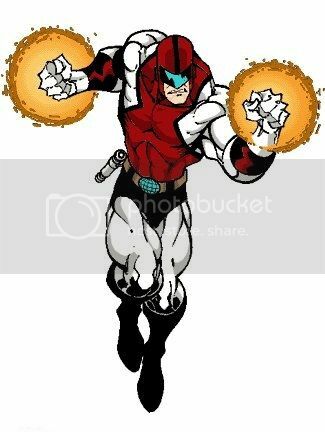 Calling himself Patrol Man, he now helps Astro-Girl (Sherry) and Headlight (Mary) in dealing with the random assortment of criminals they always run into while roaming across the United States. Costs: Abilities 26+ Skills 16+ Advantages 9+ Powers 35+ Defenses 22= 108 pts. Identity: Headlight keeps the fact that she is Marry Higgins a secret to protect her family. Motivation ~Responsibility: Headlight feels that her having possession of the alien crystal means that she should be helping others given the chance. Relationships: Dave Lancaster (boyfriend, aka Patrol Man), good friends with Sherry Shepard (aka Astro-Girl). Background: Mary Higgins went out for a romantic, moon light filled, walk with her boyfriend, Dave Lancaster, when they suddenly found themselves at ground zero of an space ship’s crash landing. Both Mary and Dave were hurt because of the crash, and the ship’s pilot, a humanoid girl with bright pink hair, was able to get both of them into her the vehicle’s med-bay and treat their injuries. When the pair woke up hours later they learned that their rescuer was named Sherry Shepard and that while she’d been born and raised in the far ends of space she was actually human (well half human actually, her mom was a native of the planet her Earthling father found himself on). Sherry went on to tell Mary and Dave that she’d travelled back to Earth to learn more about her father’s home and her connection to it. Seeing a few problems with her plan, the couple offer to act as her guides as to keep her extraterrestrial nature a secret. Thrilled to have met and befriended her first Earthers, Sherry agreed and within days she was sight seeing around the country (which wasn’t exactly what Mary and Dave had in mind but simply went along with it as they had little other options). During the course of the trio’s trip they ran afoul of numerous super crooks who seemed to be targeting the locations Mary and Dave were showing to Sherry, which is when they learned that Sherry had been raised at the side of a space adventurer and had picked up a number of tricks of her own during that time that were useful in the situations they constantly found themselves in. Eventually Sherry decided that she needed to have backup and after raiding the storage locker on her ship she presented Dave and Mary with two unique items; in Mary’s case she was given a gemstone that bonded to her forehead and bestowed several light-based abilities to her. Calling herself Headlight, she now helps Astro-Girl (Sherry) and Patrol Man (Dave) in dealing with the random assortment of criminals they always run into while roaming across the United States. Costs: Abilities 68+ Skills 16+ Advantages 10+ Powers 43+ Defenses 13= 150 pts. Daddy Issues: Hammer Maiden is actually the daughter of Thor, Norse God of Thunder, but she has never had a relationship with him. Identity: Hammer Maiden keeps the fact that she is Nola Lewin a secret. Motivation ~Proving Herself: Hammer Maiden tries to be the best hero she can be while carrying on the legacy of her father. Background: Nola Lewin can’t remember a time where she wasn’t ‘big for her age’, always standing inches over the heads of her classmates in school until high school where she could look most boys squarely in the eye. Plus she never seemed to get sick and while she never possessed a bodybuilder’s physique she was solidly built and had a level of strength that was surprising for not only a girl but anyone her age. Then after Nola turned thirteen she started having odd dreams about powerfully built men in heavy armor wielding deadly looking melee weapons fighting monsters that were the things of legends. When she’d awaken Nola found that she could recall every detail of her dreams unlike most others she’d had over the years, in fact she could still barely smell the scent of coppery blood mixed with sweat with the faint ring of steel clanging. Eventually Nola figured out her dreams were about Vikings of all things and soon she had a deep interest in the period of history that pertained to them. During the summer Nola turned fifteen, her parents took her to a Renaissance Fair and while there she saw a blacksmith working at filling some of the orders he’d taken during the event. Watching the man work metal into various shapes and working edges into the weapons he was forging piqued Nola’s interest and she asked the man if he was maybe looking for an assistant, to which he flatly said no and shooed her away. But Nola wouldn’t accept that and over the next year she spent a good deal of time learning all she could about metal working; from the smithing process to forging, welding and finishing. And when the blacksmith returned with Fair that following summer Nola impressed him with the amount of book based knowledge she’d gained that he agreed to take her on as his apprentice. Fortunately the blacksmith lived nearby and Nola was able to spend the majority of her free time at his home, where his main smithy was located. Nola spent years learning the art of blacksmithing under her teacher’s watchful eye, who simply told her to call him Grim, developing her skill in smithing and learning how to use the weapons she made though she still had the same haunting dream. On her eighteenth birthday Nola had a vision in which a large, red bearded man who wore furs and leather, who said his name was Thor. He told the young girl how he was her real father as well as how he’d met her mother while on a quest given to him by his father, her grandfather, Odin. During that time the god fell in love with a mortal who was helping him and how she eventually became pregnant with Nola. He then told her that he'd been forced to leave them both before Nola was born, called back to Asgard to deal with an impending invasion by foes of the golden realm. Learned everything she’d need to know Thor sent a friend of his, a dwarf, to Midgard to teach her, man she knew as Grim. But now the time had come for Nola to make her own way in the world as Grim had taught her all he could. Thor did bestow a gift upon Nola however; a war hammer he'd commissioned Grim to forge for her and she later learned that it had been enchanted by the dwarf. After Thor had left the two of them, Nola was unsure of what to do next and it was Grim who put forth the idea of her simply doing as heroes in the old tales had done – wander the land in search of evils to be punished. Deciding that being a modern day version of her father wasn’t half a bad idea, Nola packed what few belongings she had into a bag and was about to set off in her quest as she realized that she did not want to go it alone. Minutes later Grim had packed the things he felt he’d need and set out with Nola and the two of them have been wandering across the country now for just over a year, performing good deeds and facing evil wherever they find it. Costs: Abilities 78+ Skills 40+ Advantages 25+ Powers 98+ Defenses 12= 253 pts. Enemy: Orcs, Goblins, Giants and Trolls. Relationship: Nola (aka Hammer Maiden). Responsibility: Grimdore has made an oath to his friend Thor, that he will help and protect the God of Thunder’s daughter. 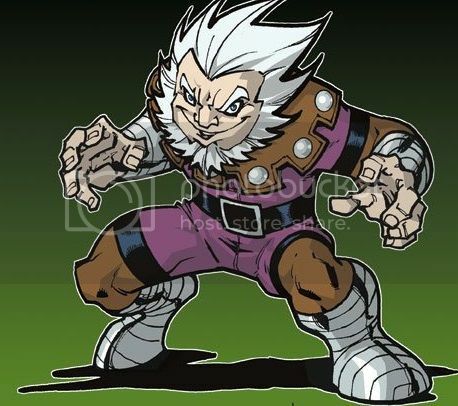 Background: Grimdore Silverforge came from the Imagineria several decades ago at the request of Thor, Norse god of thunder, to locate his daughter and teach her how to fight. The problem was that Grimdore had no way of specifically locating Thor’s daughter as the God of thunder hadn’t given him any way to identify her or told her exactly where she lived (of course the problem was that Thor had no clue where his daughter was due to her mother moving them shortly after giving birth). Thus it took Grimdore just over thirteen years to find her, but when he did there was no doubt she wasn’t the child of Thor. The girl, one Nola Lewin, expressed an interest in learning the art of blacksmithing to Grimdore but he turned her away as a true test and sure enough a year later Nola returned to him spouting off all of the information she’d taught herself over that period of time in an effort to prove to him that she was serious about learning the craft. Impressed as well as convinced this was the child he’d been sent to locate, Grimdore took Nola on as his apprentice. Over the following five years Grimdore taught Nola almost everything he knew about blacksmithing (except for how to create magical weapons, dwarves never share that knowledge) as well as how to use the weapons she made. Slowly but surely over that time Grimdore warmed up to the girl and eventually came to look upon her as a part of his own family, a really tall niece if you would. But several months before Nola was to turn eighteen Grimdore was contacted by Thor and told to forge an enchanted weapon for her, a war hammer specifically, and to wait to give it to Nola at a specific place at a certain time. Grimdore realized what that meant: that his time with Nola was almost done. With a heavy heart the dwarf did as the God of Thunder bid, and the resulting weapon is one he considers to be amongst his best works ever. 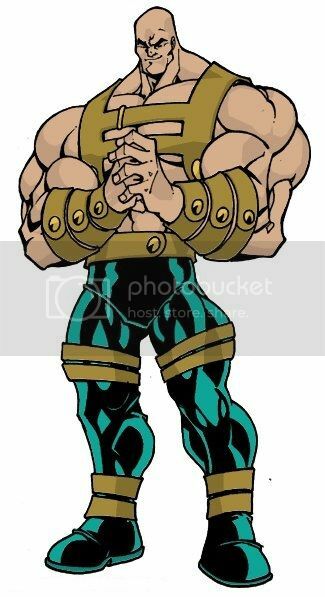 It was only a few days after he’d finished the hammer that Thor contacted Grim again and told him a specific time to give the weapon to Nola. When the time Thor had told spoken of finally arrived Grimdore appeared in the doorway of Nola’s room at his place with the war hammer in hand, presenting it for the girl to take hold of while Thor explained to her what it was. After Thor left them, Nola was unsure of what to do next and it was Grim who put forth the idea of her simply doing as heroes in the old tales had done – wander the land in search of evils to be punished. Deciding that being a modern day version of her father wasn’t half a bad idea, Nola packed what few belongings she had into a bag and was about to set off in her quest as she realized that she did not want to go it alone. Last edited by Tattooedman on Mon Mar 10, 2014 2:20 pm, edited 1 time in total. Costs: Abilities 38+ Skills 8+ Advantages 15+ Powers 85+ Defenses 9= 155 pts. Identity: The fact that the Human Shield is actually Arthur Kincaid is a secret he keeps. Motivation ~Responsibility: The Human Shield believes that he should use his powers for the betterment of others. Self Sacrifice: The Human Shield will always put himself in between others and dangerous attacks. Background: A victim of the Wild Strike, Arthur Kincaid was one of the lucky few in Bay City that was caught in that event to not have his appearance altered in any major way (his hair did turn white) though he gained super powers like all the others – his were that his body became virtually invulnerable to harm. Deciding that he should use his newly gained powers to help others, Arthur wasted no time in putting together a costume and hitting the streets of Bay City as the Human Shield. Over the years since he has developed a strong following of fans as Arthur continues to put himself in between others and various forms of danger, trusting in his superhuman toughness to get him through most any event. Costs: Abilities 54+ Skills 9+ Advantages 5+ Powers 23+ Defenses 8= 99 pts. 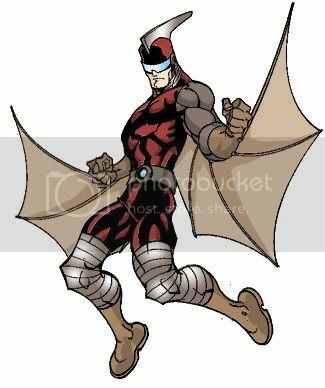 Prejudice: Batwing's appearance mark him as an obvious metahuman. Relationships: His best friends are Red Rover (Jake Hardy) and Doc Fin (Drew Lewis). Background: A college student, Dale Evans found himself numbered among those transformed by the Wild Strike. All were of a nature that his biology was turned into a hybrid of a human and a bat. Over the following months he was cleared of any signs of bad health by specialists from the Albright Institute and allowed to leave their building. During those months Jake had befriended a few other victims of the Wild Strike, Drew Lewis and Jake Hardy, and when they were released together Dale and Jake had nowhere to go until Drew offered to let them move in with him in his home/lab. The only problem there was a few Drew lost the funding he’d had to keep his lab operating due to his backer’s lack of faith in him given his transformation. He only had a few weeks until the rent was due on the lab and Drew had no available funds that could cover the amount due. Their problem was solved when they reached out to the Albright Institute and found themselves dealing with Langston Albright personally. He brokered a deal with them that allowed Drew to in charge of monitoring the long term effects the Wild Strike had on their bodies while the Institute covered his cost of operating his lab. While this worked out well for Drew, it left Dale and Jake with large amounts of time on their hands to keep themselves busy. Eventually the physical nature of their powers led them to becoming involved in dealing with the criminal element that surrounded them on the docks and soon all three of them were becoming known as local heroes, not as big as the Champions but they’re staying involved in more mundane crime led to the public thinking of them as more ‘street styled’ heroes than end-of-the-world savers. Costs: Abilities 72+ Skills 18+ Advantages 15+ Powers 18+ Defenses 8= 131 pts. Canine Nature: At times Jake has trouble going against Dale and Drew as he now favors pack mentality and wants to follow the lead of the others. Other times he can fall into canine behavior that others might find odd for a person to be doing (marking territory and such). Relationships: His best friends are Batwing (Dale Evans) and Doc Fin (Drew Lewis). Background: A private investigator, Jake Hardy found himself numbered among those transformed by the Wild Strike. Granted his alterations weren’t all that physical in nature, but instead were more mental as his biology was turned into a hybrid of a humans and a canine. Over the following months he was cleared of any signs of bad health by specialists from the Albright Institute and allowed to leave their building. During those months Jake had befriended a few other victims of the Wild Strike, Drew Lewis and Dale Evans, and when they were released together Jake and Dale had nowhere to go until Drew offered to let them move in with him in his home/lab. While this worked out well for Drew, it left Jake and Dale with large amounts of time on their hands to keep themselves busy. Eventually the physical nature of their powers led them to becoming involved in dealing with the criminal element that surrounded them on the docks and soon all three of them were becoming known as local heroes, not as big as the Champions but they’re staying involved in more mundane crime led to the public thinking of them as more ‘street styled’ heroes than end-of-the-world savers. Costs: Abilities 60+ Skills 15+ Advantages 10+ Powers 15+ Defenses 16= 116 pts. Disability: Like dolphins, Doc Fin has no sense of smell. Prejudice: Doc Fin’s mutations mark him as an obvious metahuman. Relationships: His best friends are Red Rover (Jake Hardy) and Batwing (Dale Evans). Background: A biologist in Bay City, Drew Lewis was one of the many people affected by the Wild Strike; in Drew's case his body became a hybrid of human and dolphin. Over the following months he was cleared of any signs of bad health by specialists from the Albright Institute and allowed to return to his job. During those months Drew had befriended a few other victims of the Wild Strike, Jake Hardy and Dale Evans, and when they were released but had nowhere to go he let them move in with him in his home/lab. After weeks later Drew lost the funding he’d had to keep his lab operating due to his backer’s lack of faith in him given his transformation. He only had a few weeks until the rent was due on the lab and Drew had no available funds that could cover the amount due. Their problem was solved when they reached out to the Albright Institute and found themselves dealing with Langston Albright personally. He brokered a deal with them that allowed Drew to in charge of monitoring the long term effects the Wild Strike had on their bodies while the Institute covered his cost of operating his lab. Costs: Abilities 18+ Skills 13+ Advantages 2+ Powers 29+ Defenses 12= 74 pts. Relationship: She is dating her business partner, Max Martin (aka Mover). Responsibility ~Business Owner Mover & Shaker’s is Cesaria’s baby, started up and funded by her efforts alone and she currently keeps the books for the company and works their contacts in an effort to drum up business for them. Background: One half of the company called Mover & Shaker's, Cesaria Esparza is a graduate of Claremont Academy who earned a degree in business management and opened up her own unique company that specialized in demolition for hire. Using her ability to generate vibrational energy, Cesaria is able to basically destroy a whole building on her own and without any risk to anyone (unlike setting explosives all about a buildings foundation). She takes jobs all over the US, as she can't generate enough business in Freedom City alone to support herself. 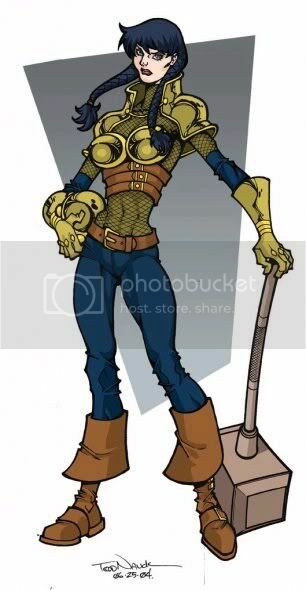 A year ago Cesaria hired telekinetic Max Martin, also known as Mover, to work with her on jobs since her powers only let her demolish buildings. Not remove the debris, but Max's could. At first they're relationship was purely business but as they spent more time together working and traveling the pair quickly fell in love. Eight months later Cesaria made Max a full partner, they split the business 50/50, and they plan to marry next year as their company continues to grow. Costs: Abilities 20+ Skills 7+ Advantages 2+ Powers 67+ Defenses 21= 117 pts. Relationship: He is dating his business partner, Cesaria Esparza (aka Shaker). Background: Max Martin is a possesses a strong telekinetic talent that is able to move massively huge amounts of weight. 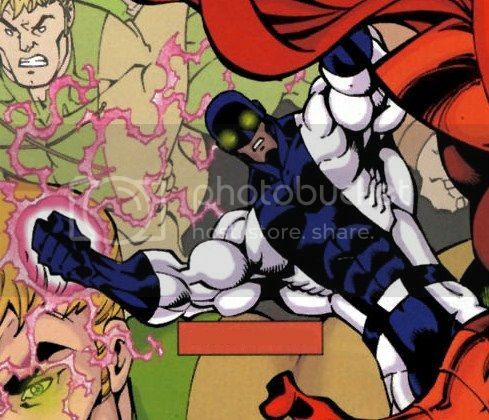 One interesting fact about Martin is that when his psionic powers first manifested he weighed 307 lbs but then woke up one morning with an almost sculpted physique. Scientists at the Albright Institute have theorized that Lifter subconsciously used his powers to change the shape of his body while he slept. Not wanting to get into the cape & cowl set, Martin focused on looking for a way to cash in on his powers, and he soon found the one-woman company called Mover & Shaker's that was owned by Cesaria Esparza, a metahuman with vibrational based powers who used them to demolish buildings set to be tore down. Immediately seeing a niche he could fill, Martin approached Cesaria and explained his idea. To which she wasn’t all too sold on until Martin gave her a demonstration of his powers, which quickly changed her mind as he lifted up the building she ran her company out of (a two-story building that held Cesaria’s apartment over top her business). That was a year ago and in the time since, Mover & Shaker’s has almost tripled their income. Also during the past year, Martin and Cesaria slowly fell in love with one another and have only just recently admitted their feelings to one another, and now that they’ve admitted how they feel and gotten engaged Cesaria has made Martin co-owner of their company and they duo intend on getting married next year. Costs: Abilities 34+ Skills 14+ Advantages 10+ Powers 40+ Defenses 17= 115 pts. Identity: The fact that Charlie Torres is actually Weathercaster is a secret he keeps. Relationships: His mother (Heather Torres). Background: Charlie Torres was born twenty years ago to Heather Torres, a young, unmarried meteorologist who insisted on keeping her child and went on to raise him on her own while continuing to work in the demanding field of meteorology. As a result Charlie spent great deal of time with neighbors and baby sitters growing up, but he never doubted his mother’s love for him. From an early age he understood she worked a demanding job and it was something she was passionate about but she made sure never to miss a birthday or baseball game of Charlie’s ever. When he was sixteen years old, Charlie began to show signs of having the ability to manipulate the weather. Soon his mother began giving her son ‘lessons’ on how to control his powers thanks to her understanding of the various weather effects worked. Now at the age of twenty, Charlie has started wearing a costume and going out onto the streets of San Antonio to fight crime using his powers as the hero Weathercaster. So far he’s been building a good reputation as a dependable hero with impressive control over his powers, but to be honest he’s not had to deal with a superhuman crook yet either. Costs: Abilities 36+ Skills 13+ Advantages 4+ Powers 60+ Defenses 11= 124 pts. 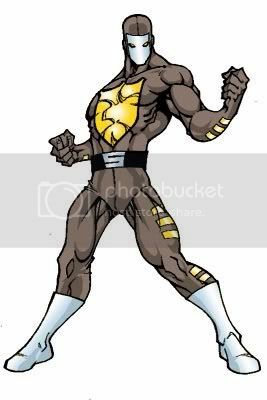 Identity: Anthony works under the stage name Pitchback, to protect both himself and his family from anti-metahuman hate groups. Rigors of Flight: Although Anthony's body has adapted for high speed flying, when he pushes his limits, it can put his body under incredible speed and heat. 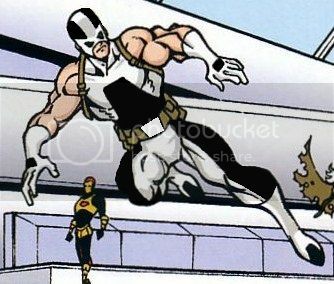 Background: Anthony Arnoldson never wanted to be a superhero, he was more interested in being a commercial pilot, but at the age of nineteen as he was out flying an old beat up, rented plane he used to develop the skills he’d need for his chosen profession, a malfunction with the controls happened and he was forced to eject. His problems compounded when his parachute developed a tear and he plummeted hundreds of feet down when his power of supersonic flight manifested (his body became denser and stronger to withstand the rigors of flight). Determined to not become a super villain Anthony decided to use his powers not as a superhero but as an entertainer, taking the name Pitchback (an older aviation term) he created a one-man air show where he displays of stunt flying without a plane.